To connect with customers today, you have to do more than give them what they want, when and how they want it. You have to anticipate what they’re looking for before they even know they want it, create extraordinary experiences that delight them and keep them coming back. However, yesterday’s analytics tools just can’t keep up with digital, multichannel, demanding customers. It takes a whole new level of insight to see things through their eyes. Read this guide to discover the three major challenges of dealing with ordinary analytics, along with innovative strategies to solve them. 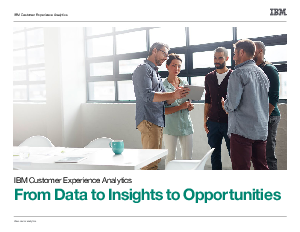 Discover how IBM Customer Experience Analytics can help you go on a journey with your customers and create the kind of engagement that builds lasting loyalty.